Absolute Medical Billing Software by Crystal Clear Solutions. Medical billing for the physician, podiatrist and chiropractors. Electronic billing software and medical billing software for Windows systems. 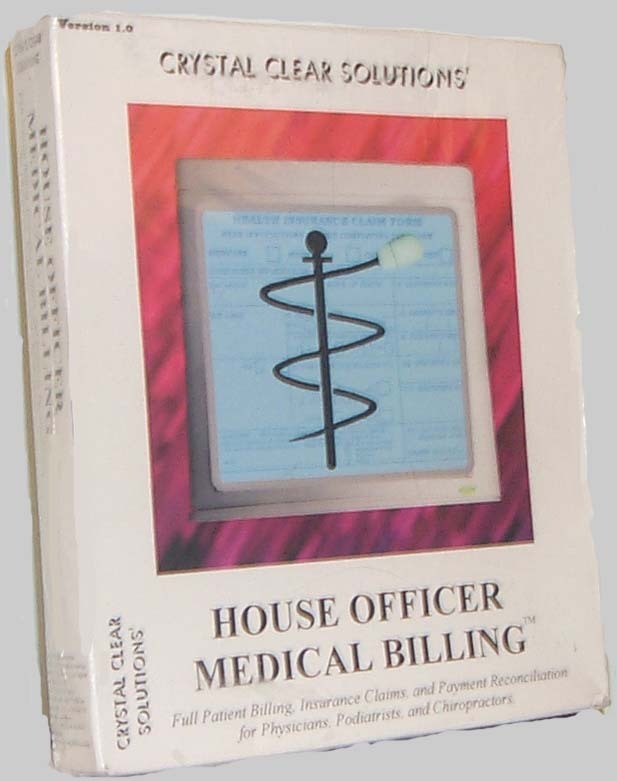 Medical billing and electronic billing does not have to be expensive to be good. Our company was founded by doctors, accountants, and office managers to give doctors state-of-the-art medical billing software at an affordable price. Why pay thousands of dollars for a program when other commercial software sells for a few hundred dollars? Do other companies tell you that you will have to pay yearly renewal fees to use the same software? Do they tell you that upgrades cost thousands of dollars? When you purchase our software it is yours...there are no other fees! Our medical billing software will allow you to create HCFA claims, electronic billing claims and patient statements in seconds. 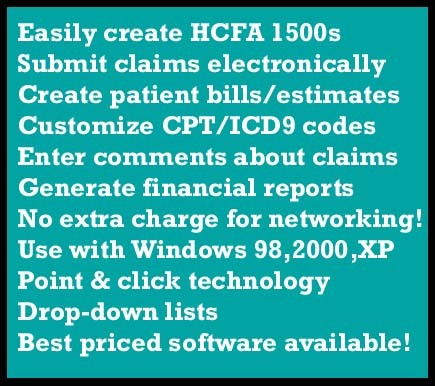 You can print HCFA-1500 copies or submit the claim electronically to thousands of insurance companies through WebMD - the largest clearinghouse in the United States. Our program allows you to age accounts, reprint overdue claims and compile financial and statistical practice management reports to fine tune your practice. Our Windows program holds unlimited patient and coding data, and can be networked throughout your office depending on your network hardware/software and local computer support. We also offer free initial training and a technical support hotline. Go to our download page and get a 30 day evaluation copy of the program for free and see for yourself. You could pay more, but why? Many have come to use our software and say it is the best Windows billing software for the doctor in the market today. "So easy to use" and "I can't believe I kept paying that other company a $500 renewal fee each year for nothing!" are some of the things we hear. But don't take our word for it. Click here to download a working copy of the program to try for yourself. The screens make sense because they were designed based on how the forms are actually filled out and not what was the easiest way to write the software. can get them shipped for FREE! Just click here for the forms. We support data exchange with MediNotes Charting Software!